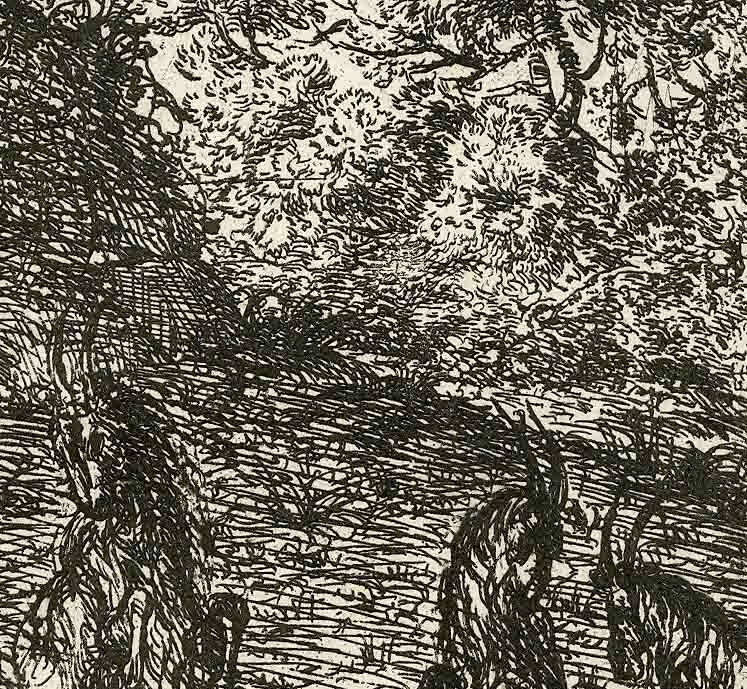 What are the recurring attributes to be found in the prints of a genius? 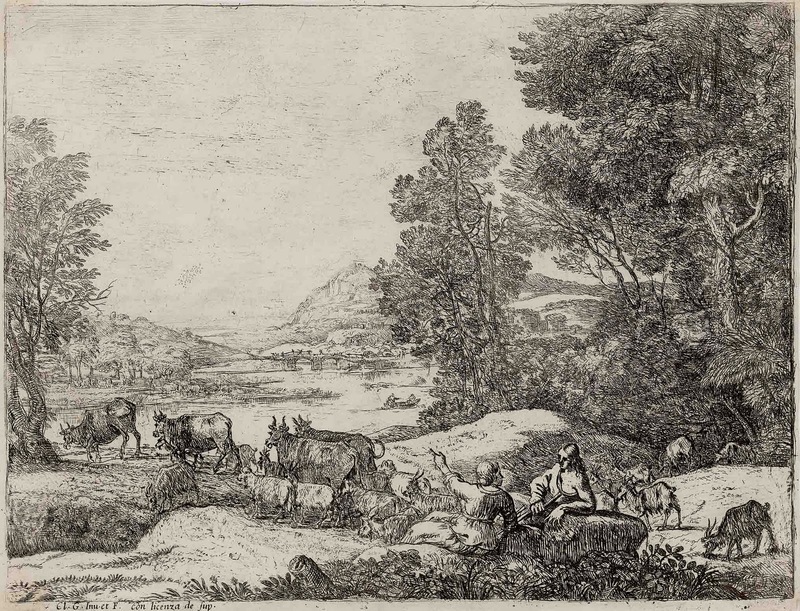 Claude Lorrain (also known by his family name, Claude Gellée, c. 1604/05–1682) is one of history’s great draughtsmen. 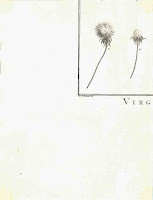 His line work reveals a surety of touch with each mark showing evidence that it was laid with unhesitating confidence. Moreover, his compositions are a compendium of visual devices that other artists have referenced for ideas over the centuries. Like all artists, there is a difference between his earlier prints when he was refining his methods and those created during his artistic maturity. Nevertheless, the early works exhibit many of the same attributes that make his later works so engaging to look at. In the following discussion I will focus on several aspects of his artistic practice that were constant throughout his life by comparing an early print, The Three Goats (c. 1634), with one from his mature years, Shepherd and Shepherdess (c. 1652). Condition: The print is cut on plate mark (as published by McCreery). It is in pristine condition and is not pasted down. 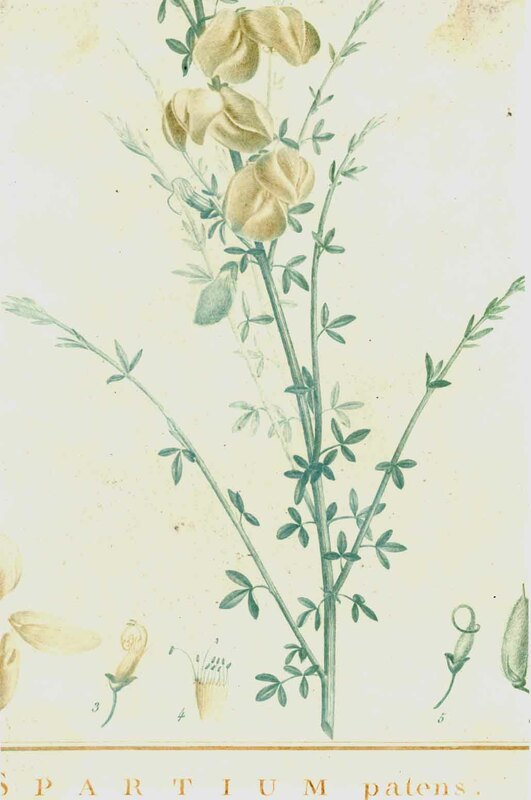 The back of the print features a section of a botanical engraving from the 1784 Paris edition of Stirpes Novae (see image below). 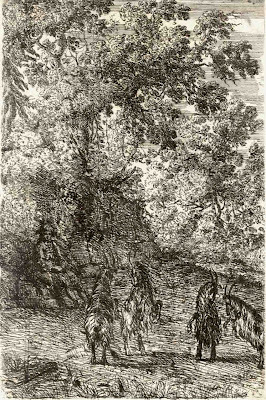 The trimming of prints and the printing on the verso pages from Stirpes Novae for the 200 Etchings folio is discussed by Lino Mannocci (1988) in The Etchings of Claude Lorrain (p. 28) and by H. Diane Russell (1982) in Claude Lorrain 1600–1682 (p. 300). I am selling this print for $220 AUD including postage and handling to anywhere in the world. Please contact me using the email link at the top of the page if you are interested or click the “Buy Now” button. Condition: The print is cut on plate mark (as published by McCreery). It is in pristine condition and is not pasted down. 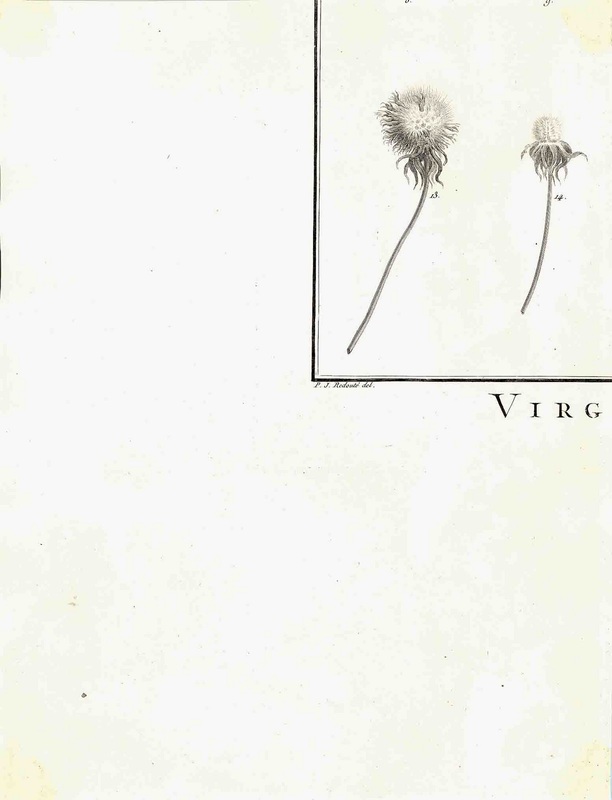 The back of the print features a section of a botanical engraving from the 1784 Paris edition of Stirpes Novae (see image below). 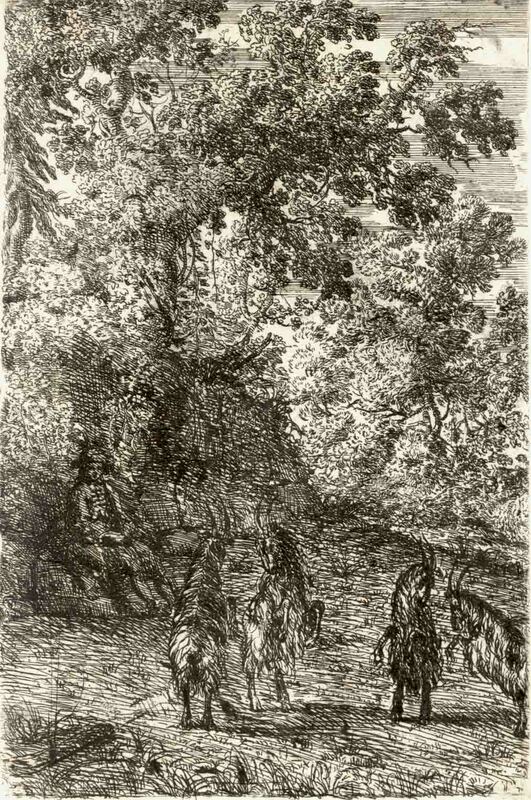 The trimming of prints and the printing on the verso pages from Stirpes Novae for the 200 Etchings folio is discussed by Lino Mannocci (1988) in The Etchings of Claude Lorrain (p. 28) and by H. Diane Russell (1982) in Claude Lorrain 1600–1682 (p. 300). I am selling this print for $320 AUD including postage and handling to anywhere in the world. Please contact me using the email link at the top of the page if you are interested or click the “Buy Now” button. I’ll begin this comparison by discussing Lorrain’s drawing style. The Three Goats shows stylistic consistency of mark making in terms of there being similarity in the types of line used. 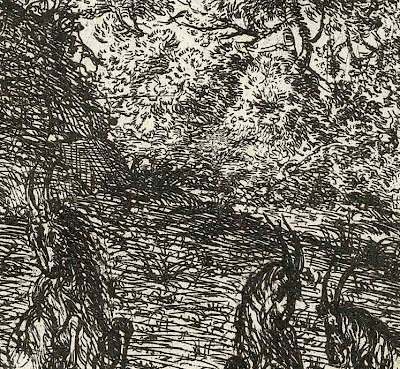 By this I mean the way that Lorrain draws a goat is not very different to the way he draws a tree or a figure: all are woven into the same web of marks without significant differentiation. 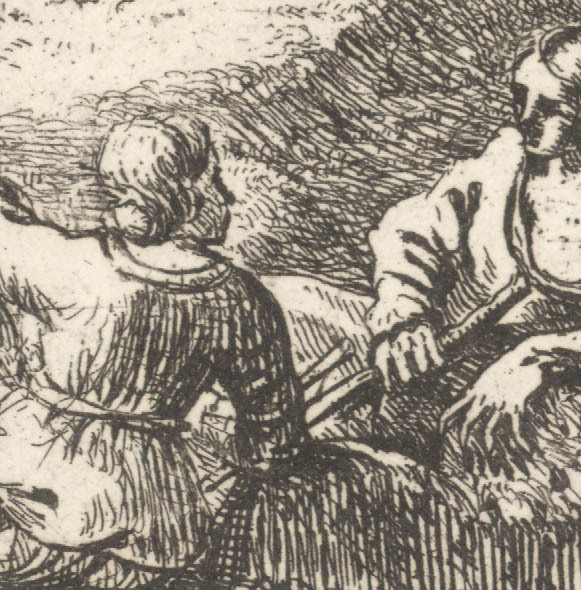 This visual democracy of treatment when depicting a range of subjects is summarised by an artist friend of mine who proposed that Lorrain’s stylistic consistency is his “shaggy goat stroke.” Although there are variations in the marks he used in this early print (e.g. 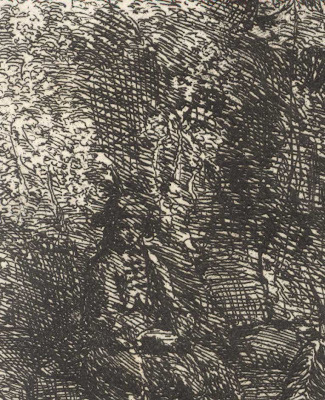 the length of stroke is smaller in the rendering foliage and the lines rendering the ground are hatched and longer as seen in the detail below) the inherent gesture of each stroke (i.e. Lorrain’s signature way of making marks) is recognisably his own. To my eye, an essential component of his signature style is the looped curve—not quite to the extent of the return stroke that Mantegna and Pollaiuolo used. This curve in his strokes pictorially “grasps” small areas of space. The phenomenon is the same as created in good calligraphy (especially Oriental calligraphy) where the tiniest flick at the end of a stroke effectively closes around space to suggest form, as can be seen in the detail of foliage below. 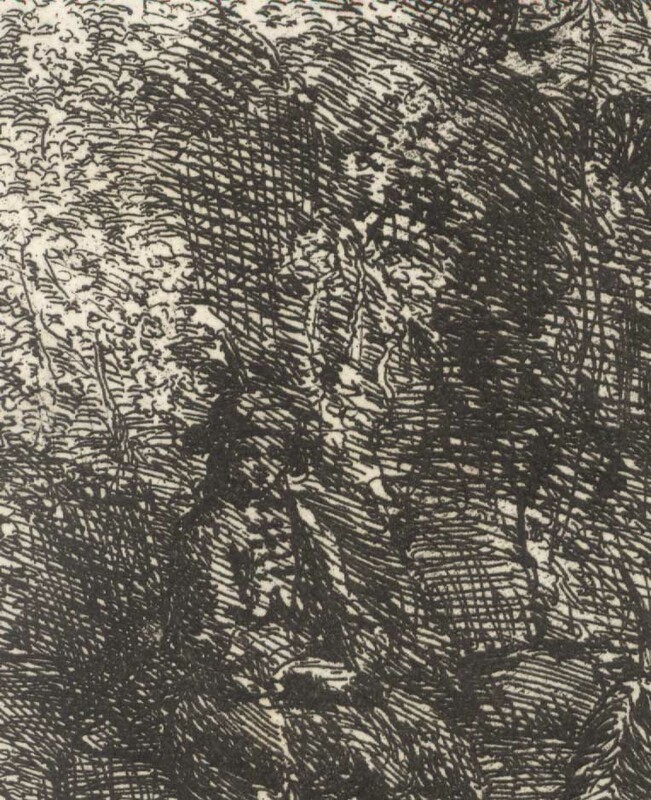 An example of how he uses marks in his earlier print to invite a viewer to “look at this” can be seen below in the simplification of the portrayed figure to only two tones: black and a mid-tone created out of a single layer of angled hatching. 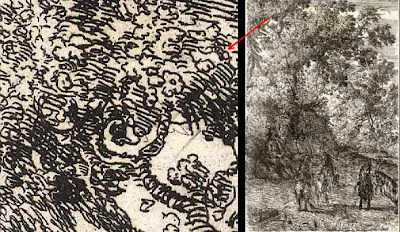 By comparison, an example of how he averts attention away from areas that he does not want the viewer to look at can be seen in the treatment of the figure’s immediate background: a layering of misaligned marks that approximate the appearance of cancellation marks. In Shepherd and Shepherdess Conversing in a Landscape Lorrain’s approach to inviting and averting a viewer’s gaze is much more subtle. For example, look at the way he uses fine marks in front of the woman’s face. In a pictorial sense they render a patch of light in the background but in a graphic sense they project the idea of conversation in a similar way that a cartoonist might use a speech bubble. Moreover, compare the treatment of these background marks with the much cruder hatched marks behind the man that avert a viewer’s eye from the background and draw attention to him.